Hello Everyone. I'm Lee Oliphant, a retired educator, certified master garden and garden columnist. My husband and I live in Cambria, a little town along the central coast of California. Because my garden is central to my life, I asked my husband to build a coop and run that would enhance the garden. He set about to make that happen. I'm pleased with the way it looks and works for the hens. And, after two years the only changes we've made is to let the plants grow up and around it. It now looks like it has been there forever. Before getting the hens, we did our homework and chose six breeds that we thought would be "calm, good layers of brown eggs, and good pets". On the whole, we've been satisfied with our choices and the girls are great pets. We have a Buff Orpington, a Barred Rock, a Rhode Island Red (now passed away), an Ameraucana, a Silver-laced Wyandotte, and a Golden-laced Wyandotte. 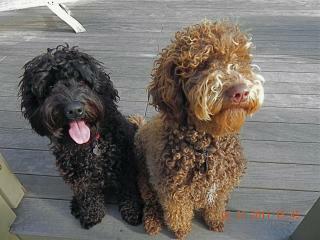 Our latest project has been raising two Australian Labradoodles named Maddie and Tillie. They are now learning to love the hens. Maybe a little too much. I have two websites that I enjoy working on. One is called BACKYARD HENCAM. We have two cameras, one on the outside run and one on the two nesting boxes. I have written articles on raising chickens that I have placed on the website. My other website is named CENTRAL COAST GARDENING. I update this blog weekly and cover all subjects relative to gardening on the Central Coast of California. I will continue to be an enthusiastic supporter of BYC as it gives all of us who love chickens, a place to share and learn from one another.